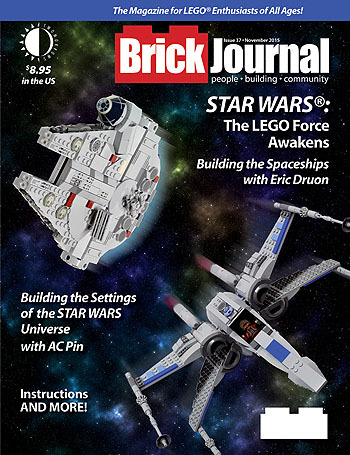 The LEGO Force has awakened in BrickJournal #37, out now! This weekend, Star Wars: The Force Awakens debuts. And right now, the new issue of BrickJournal pays tribute to George Lucas’ film universe with a special SW-theme! The magazine for LEGO enthusiasts returns to a galaxy far, far away with amazing ships by ERIC DRUON (also known as BaronSat), and some incredible galactic layouts by builder AC PIN! There’s also a look at the many droid creations built by LEGO fans, plus our regular feature on Minifigure Customization by JARED K. BURKS, AFOLs by cartoonist GREG HYLAND, step-by-step “You Can Build It” instructions by CHRISTOPHER DECK (including how to build a BB-8), and more! Truly, this is the LEGO publication you’ve been looking for! See a free preview and order HERE! This entry was posted in TNT on 15 December 2015 by Mr. Morrow.